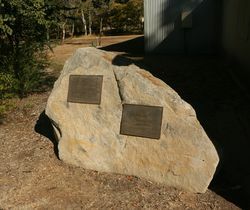 A monument commemorates the centenary of the Federation of the Australian Colonies. 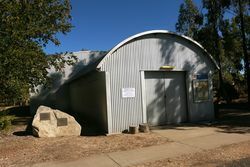 The Federation of Australia was the process by which the six separate British self governing colonies of Queensland, New South Wales, Victoria, Tasmania, South Australia and Western Australia formed one nation. When the Constitution of Australia came into force, on 1 January 1901, the colonies collectively became states of the Commonwealth of Australia. 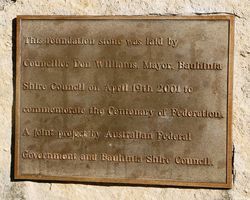 This foundation stone was laid by Councillor Don Williams, Mayor, Bauhinia Shire Council on April 19th 2001 to commemorate the Centenary of Federation. A joint project by Australian Federal Government and Bauhinia Shire Council. 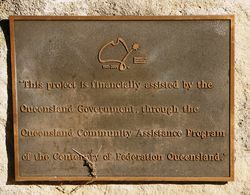 "This project is financially assisted by the Queensland Government, through the Queensland Community assistance Program of the Centenary of Federation Queensland."